After breakfast in Arusha, drive to Tarangire to discover the giant termite mounds and baobab trees of Tarangire. This park is famous for its large elephant population, scenery and diversity of birdlife. Overnight at Tarangire Sopa Lodge. Tarangire's wildlife includes elephant, lion, giraffe, warthog, ostrich, impala and baboon. Leave the lodge at 9am for Serengeti National Park. Pass through Ngorongoro Conservation Area along the way, pausing to view the Crater. As you drive to the lodge, game drive along the way viewing the park's resident and migratory animals. 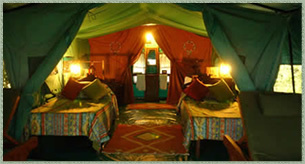 Overnight at Serengeti Sopa Lodge, located in the heart of the Serengeti. Spend the morning in the Serengeti. Eat lunch in the park before leaving for Ngorongoro Conservation Area. Arrive at the Crater rim campsite in time for the spectacular sunset. Dinner and overnight at Ngorongoro Sopa Lodge.